Context: Psoriasis is an inflammatory disorder, formed by inappropriate interaction of T lymphocytes with keratinocytes, and consequent eruption of immune responses. High concentrations of tumor necrosis factor-alpha (TNFα) are found in the skin lesions and plasma of patients with psoriasis. Hypericum perforatum, a phytomedicine that has both anti-inflammatory and antiproliferative properties, has been recently reported to be clinically helpful for improvement of psoriatic lesions. Aims: The aim of the present study was to investigate the effects of topical H. perforatum on TNFα levels in psoriatic lesions for possible identification of the mechanism by which Hypericum reduces inflammation and modulates the disease in patients with plaque-type psoriasis. Settings and Design: A double-blind, placebo-controlled, pilot study with intraindividual comparison was conducted on twenty patients with mild to moderate plaque-type psoriasis. Subjects and Methods: TNFα levels in tissue samples were measured with immunohistochemistry method. Moreover, Psoriasis Area Severity Index (PASI) scores and histological and clinical changes were investigated after topical application of Hypericum extract. Statistical Analysis Used: The Wilcoxon signed-rank test was used to evaluate the possible differences between the drug and placebo group. Results: TNFα concentrations in dermis (p= 0.025), endothelial cells (p=0.033), and dendrite cells (p=0.014) were significantly reduced in lesions treated with drug and the reduction observed in epidermis was superior to placebo (p=0.046). Results of PASI scores showed that erythema, scaling, and thickness were significantly lower where the ointment had been applied compared to application of placebo (p=0.014, p=0.004, p=0.003, respectively). Moreover, significant improvement in clinical and histological features of treated lesions in comparison with untreated lesions was observed (P < 0.05). Conclusions: H. perforatum ointment can help decrease PASI scores and TNFα levels in psoriatic tissue. Its efficacy is probably related to its effect on lowering cytokines including TNFα. Introduction: Mobile phones have become indispensable for daily activities, and people are exposed to them from an early age. There is, however, concern about the harmful effect of the electromagnetic radiation emitted from the mobile phones. Objective: The objective of the study was to study the effect of mobile phone on average pure tone audiometry (PTA) threshold of the person and to study the changes in the pure tone threshold at high frequencies such as 2 kHz, 4 kHz, and 8 kHz among the students with prolonged exposure to mobile phones. Methodology: A cross-sectional study was conducted among the medical students who have been using mobile phones for the past 5 years. The effect of mobile phones on the PTA threshold in the exposed ear and the nonexposed ear was assessed. Results: The study shows that there is a significant difference in average air conduction (AC) and bone conduction (BC) hearing threshold among the exposed and the nonexposed ears (P < 0.05). A significant rise of both AC and BC threshold at individual frequencies between the exposed and the nonexposed ear is also noted in this study. Conclusion: The study conducted shows changes in the hearing threshold of the exposed ear when compared with the nonexposed ear. There are however lot of unanswered questions which provide an interesting avenue for further research. Till concrete evidence is available the only feasible way to control its exposure is to limit the duration of usage of mobile phones. Aim: This sudy aims to investigate the association between insomnia or excessive daytime sleepiness (EDS) and risk of nonalcoholic fatty liver disease (NAFLD). Methods: We searched published studies indexed in MEDLINE and EMBASE database from inception to December 2015. Studies that reported odds ratios (ORs), risk ratios, hazard ratios or standardized incidence ratio with 95% confidence intervals (CI) comparing the risk of NAFLD among participants who had insomnia or EDS versus those without insomnia or EDS were included. Pooled ORs and 95% CI were calculated using a random-effect, generic inverse variance method of DerSimonian and Laird. Cochran's Q test and I2 statistic were used to determine the between-study heterogeneity. Results: Our search strategy yielded 2117 potentially relevant articles (781 articles from MEDLINE and 1336 articles from EMBASE). 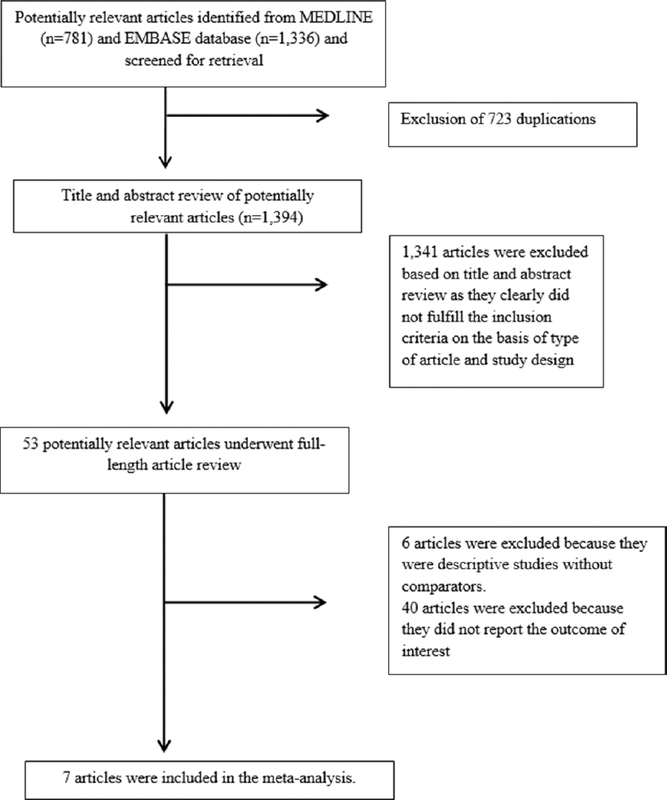 After comprehensive review, seven studies (three cross-sectional studies and four case–control studies) were found to be eligible and were included in the meta-analysis. The risk of NAFLD in participants who had insomnia was significantly higher with the pooled OR of 1.13 (95% CI, 1.00–1.27). The statistical heterogeneity was moderate with an I2 of 62%. Elevated risk of NAFLD was also observed among participants with EDS even though the 95% CI was wider and did not reach statistical significance (pooled OR 2.21; 95% CI, 0.84–5.82). The statistical heterogeneity was moderate with an I2 of 62%. Conclusions: Our study demonstrated an increased risk of NAFLD among participants who had insomnia or EDS. Whether this association is causal needs further investigations. Background: The objective of the present study was to assess the applicability of the rule of halves in an urban population of Puducherry, South India. We also aimed to find the correlates associated with undiagnosed hypertension to facilitate targeted screening. Methodology: We derive our observation from a community-based cross-sectional study conducted using the World Health Organization STEPwise approach to surveillance in urban slum of Puducherry during 2014–15. Blood pressure (BP) was measured for all the study subjects (n = 2399), and the subjects were classified as hypertensive using Joint National Committee 8 criteria, systolic BP (SBP) ≥140 mm Hg and/or diastolic BP (DBP) ≥90 mmHg and/or known hypertensives and/or treatment with antihypertensive drugs. Controlled hypertension was defined as SBP <140 mmHg and DBP <90 mmHg. 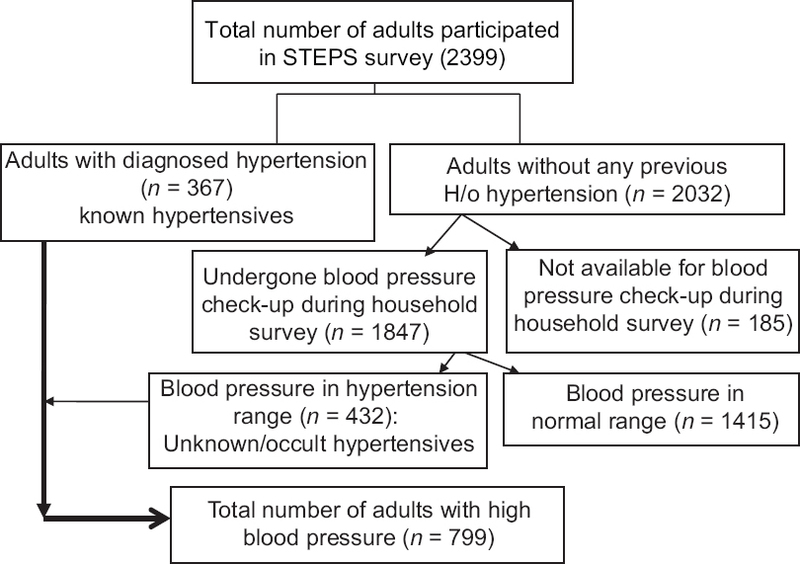 Results: Of 2399, 799 (33.3%; 95% confidence interval [CI]: 31.4%–35.2%) adults were found to have raised BP by any means (known and unknown hypertensives). Of the 799, 367 (15.3%; 95%CI: 13.9%–16.8%) of study participants were known hypertensives. Of the known hypertensives, 74.7% (274/367) were put on treatment (drugs and or lifestyle modification), and 80% (218/274) were on regular treatment. Higher proportions of men were found to have undiagnosed hypertension compared to women (26.1 vs. 19.8%, P < 0.001). Similarly, adult from below poverty line (23.8 vs. 20%, P < 0.001), unskilled laborer (26.6 vs. 20%, P < 0.001), and literacy less than middle school (12.3 vs. 23%, P < 0.001) had more undiagnosed hypertension. Conclusion: In the selected urban area of Puducherry around one-third of the adult populations are having hypertension, including the 54% of undiagnosed hypertension. Adults from the vulnerable subgroups such as lower level of literacy, below poverty line, and unskilled work are found to have higher proportions of undiagnosed hypertension. Acquiring adequate resources for anatomy education has represented a challenge throughout the discipline's long history. A significant number of collections housed in anatomy departments contain human tissue of unknown provenance with some obtained in morally dubious ways. This paper outlines the history and future prospects of one such anatomical assemblage – the Burns Anatomical Collection, currently housed at the University of Maryland (UM). The collection originally contained more than 1000 anatomically prepared mummified human remains. They were produced by the renowned Scottish anatomist Allan Burns in Glasgow in the late eighteenth and early nineteenth centuries. The prepared cadavers became a commodity and after Burns' death, were acquired by his pupil Granville Pattison, who later sold them to the UM. While the origin of these human remains is unknown, historical data suggests that most of the cadavers for the collection were obtained through grave robbing. While intensely used in anatomy teaching in the nineteenth century, specimens from the collection should now be treated primarily as historical artifacts, appropriate only for teaching medical history and ethics. Other perspectives may include repatriating and reburying the human remains and providing a memorial service. 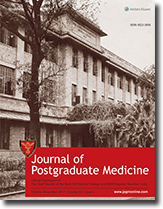 Most importantly, this collection and others similar to it should initiate dialog and reflection on the ethical aspects of the past and present medical practice. A large number of statistical tools are now used for medical decision in the core activities of diagnosis, treatment and prognosis. These tools provide undeniable help in improving medical outcomes. Prominent among them are uncertainty measurement by probability, medical indicators and indexes, reference ranges, and scoring systems. In addition are tools such as odds ratio, sensitivity, specificity and predictivities, area under the ROC curve, likelihood ratios, and cost-benefit analysis that are commonly applied in medical research but have implications for day-to-day clinical activities. These tools have so completely integrated into medical practice that statistical medicine by itself can stand alone as a medical specialty. Time has arrived to recognize statistical medicine as a medical specialty. Background: Systemic lupus erythematosus (SLE) is a systemic autoimmune disease characterized by numerous autoantibodies. In this study, we investigated the presence of anti-chloride intracellular channel 2 (anti-CLIC2) and anti-high mobility group box 1 (anti-HMGB1) autoantibodies in SLE patients (n = 43) versus healthy controls ([HCs] n = 43), and their association with serological parameters (antinuclear antibody [ANA], anti-double-stranded DNA [anti-dsDNA], and C-reactive protein [CRP]) and disease activity using Systemic Lupus Erythematosus Disease Activity Index (SLEDAI) score (active or inactive). Settings and Design: Case–control study at Rheumatology Clinic of Universiti Sains Malaysia Hospital. Subjects and Methods: The sera of SLE patients and HCs were tested for the presence of anti-CLIC2 and anti-HMGB1 autoantibodies using human recombinant proteins and ELISA methodologies. Other serological parameters were evaluated according to routine procedures, and patients' demographic and clinical data were obtained. Statistical Analysis: Mann–Whitney U-test, Chi-square test, Fisher's exact test, and receiver operating characteristic analysis. Results: Anti-CLIC2 autoantibody levels were significantly higher in SLE patients compared to HCs (P = 0.0035), whereas anti-HMGB1 autoantibody levels were not significantly elevated (P = 0.7702). Anti-CLIC2 and anti-HMGB1 autoantibody levels were not associated with ANA pattern, anti-dsDNA, and CRP. Interestingly, SLEDAI score (≥6) was associated with anti-CLIC2 (P = 0.0046) and with anti-HMGB1 (P = 0.0091) autoantibody levels. Conclusion: Our findings support the potential of using anti-CLIC2 autoantibodies as a novel biomarker for SLE patients. 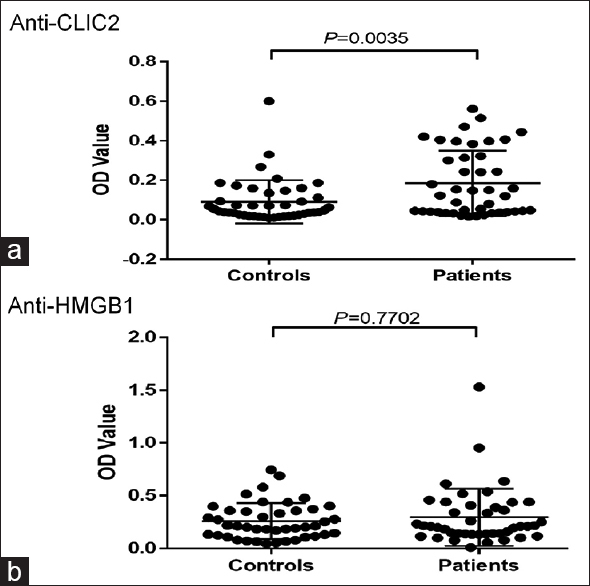 Both anti-CLIC2 and anti-HMGB1 autoantibody levels demonstrated potential in monitoring SLE disease activity. Unilateral absence of pulmonary artery or pulmonary artery agenesis (UAPA) is a rare congenital malformation that can present as an isolated lesion or in association with other cardiac anomalies. Though congenital, presentation in adults are also reported. Most common presentation in adults is of exercise intolerance. The developing lung on the affected side is hypoplastic. Diagnosis of UAPA is established by imaging methods like CT and MRI . There is no specific treatment for this condition. Treatment depends on patients symptomatology, presence of pulmonary hypertension and collateral circulation. Presence of pulmonary hypertension carries a bad prognosis. We present two adult patients with isolated left sided unilateral pulmonary artery agenesis with ipsilateral lung hypoplasia. The diagnosis was confirmed by CT chest and perfusion scan. We report a 48-day-old female infant, who developed cardiac conduction abnormalities and seizures secondary to supratherapeutic doses of oral flecainide. Flecainide was started in this infant for treatment of supraventricular tachycardia. 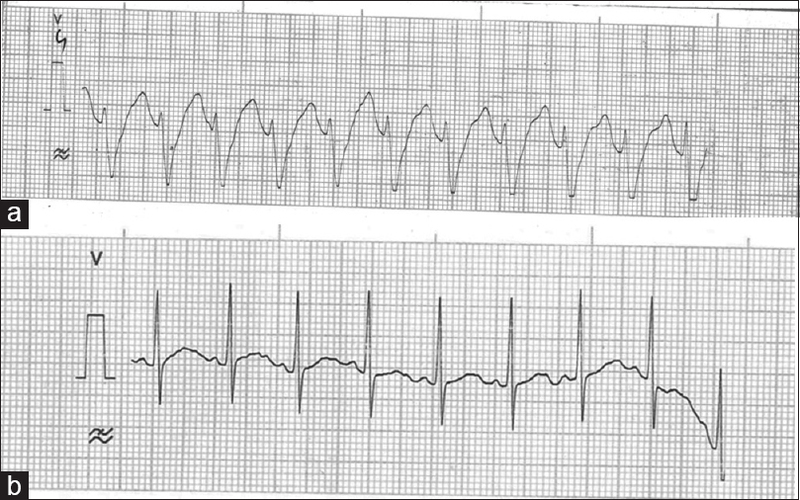 The drug was withdrawn with successful normalization of the QRS complex and no further recurrence of seizures. The Naranjo probability score for adverse drug reaction was 8, making the causality “probable.” The case restates an important message that physicians should be aware of the side effects of the drugs that they prescribe, especially of those drugs which have a narrow therapeutic window. 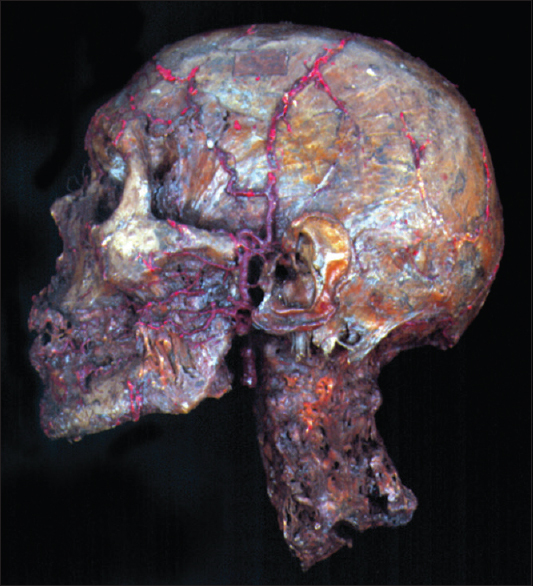 Sheehan's syndrome (SS) develops as a result of ischemic pituitary necrosis due to severe postpartum hemorrhage and is characterized by various degrees of hypopituitarism. Although the occurrence of SS is now rare, it should still be considered in any woman with a history of peripartum hemorrhage who develops manifestations of pituitary hormone deficiency any time following the event. Appropriate hormone replacement therapy results in marked clinical improvement. We present an unusual case of SS in a young lady who continued to have normal menstruation after the index event, had two spontaneous pregnancies, and was diagnosed only 11 years later when she presented to us with acute heart failure.